The Czech masters are back with full-length number nine, and it’s hard to suppress a knowing grin at their re-emergence from whatever netherworld Big Boss and co inhabit. I’ve been looking forward to this review, loving Root for their eccentricity, larger-than-life frontman, and constant ability to surprise, so it’s a bit of a disappointment that Heritage Of Satan fails to live up to expectations. After a lengthy, dull Introprincipio where Big Boss softly invokes demonic hordes, the heavy metal crunch of In Nomine Sathanas stomps in, followed by the almost punky thrash of Legacy of Ancestors. It quickly becomes clear that this is a fun album at best, not a brilliant one. Big Boss is on decent form, his malevolent deep growl as hair-raising as ever, yet the songwriting is somewhat lacking, being adequate rather than full of the spinechilling anthems that we’ve come to expect from the band. 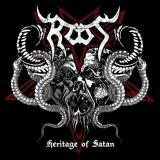 Root are nothing if not entertaining, however, and even with a self-indulgent sprawl of an album like Heritage Of Satan, there’s still just about enough meat to get to grips with. Take the catchy Revenge Of Hell, Big Boss’ croaks between the sort of riffage Slayer were coming up with in the 90s – in a good way, the band making it all work in some strange fashion! Darksome Prophet’s galloping black-thrash, moving from stomping catchiness to technical riff-worship, is another highlight, as is the Fiery Message with its maniacal laughter. The clear winner, however, is the Celtic Frost-y dirge of His Coming, deep doomy riffs beneath Big Boss’ most varied and grandiose vocal performance on the album. Fun as the thrashy likes of Greetings From The Abyss are, they don’t match the moments where Big Boss is allowed to be his glorious self. In the end, it’s hard not to wish that Root’s instrumental section matched the skills of their vocalist. You can’t help but feel that Big Boss would shine even more with a more interesting backing... certainly, a newcomer to the band would wonder what the fuss was about if Heritage Of Satan was their first encounter. Chalk this one up to Satan having an off-day, I suppose. Fans will appreciate this if hardly love it.